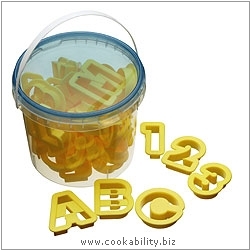 A set of 36 plastic alphabet and numeric cutters. A-Z and 0-9. Each cutter is approx 5cm high. Supplied in a see through plastic bucket container with sealable lid.